Now that we’re all caught up, on to week 4! 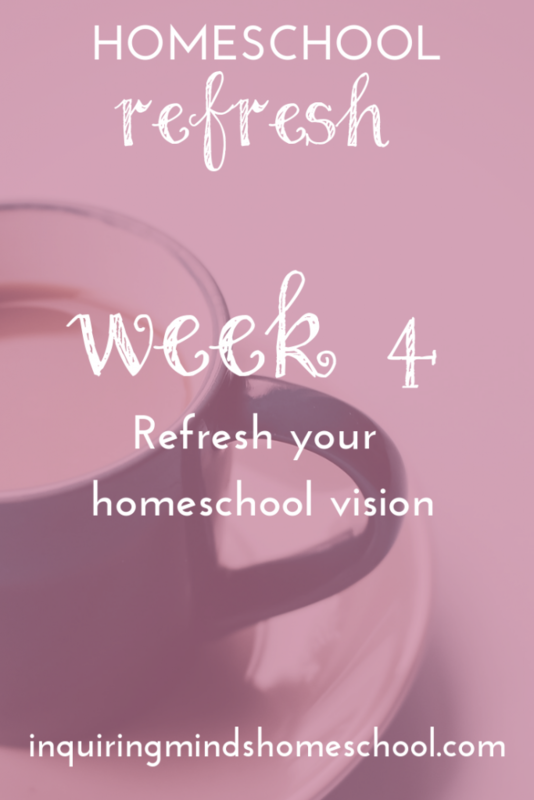 This week, I’m offering you several different options for working on your homeschool vision. 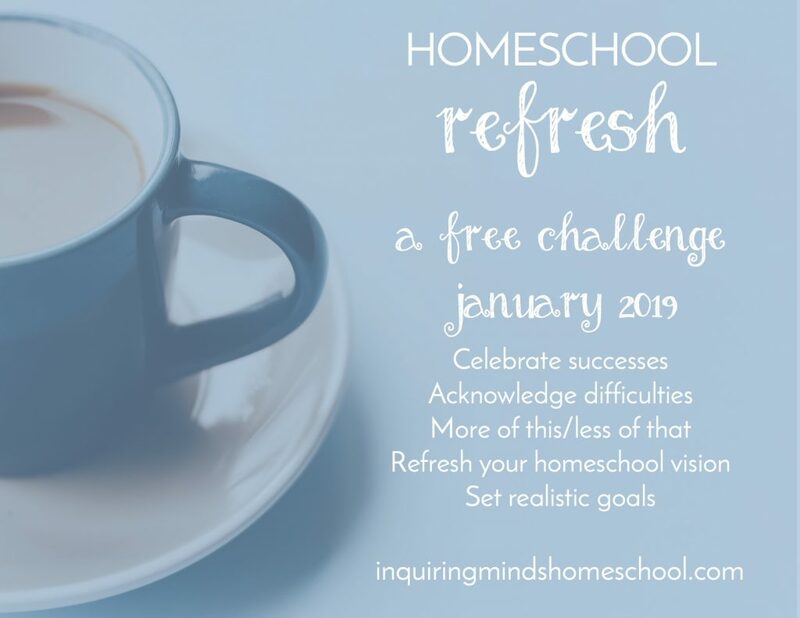 What’s a homeschool vision? It’s the big picture of what you’re trying to accomplish. It’s a mission statement, set of values, list of attributes that you want your homeschool to achieve. Don’t we all want the same things as homeschoolers? In the broadest sense, yes. We all want our kids to thrive. But what does that actually look like? Your vision of what “success” or “educated” looks like might be very different than someone else’s. Getting that out into the open will make it a LOT easier to plan out your homeschool year and set achievable goals. Here are a few examples of what a “homeschool vision” might look like. Wild and Free: I know many homeschool families who value being connected with nature and the outdoors. They pride themselves on making time each week for their kids to get muddy, stomp in rain puddles, or hike in the woods. This might extend to having mostly natural materials in the home, like wooden toys or beeswax crayons. Loving literature: I also know families who are super into books (perhaps living books or classics, or just any books that their kids are willing to read). They consider it a successful day when their kids read or hear a book read to them, regardless of whether anything else gets done that day. Classically oriented: Many families value academic achievement. They want their kids to be on grade level (or above) learning all of the important academic skills that they’ll need for later careers. They value cultural literacy, classic literature, and educational materials that have withstood the test of time. In my experience, when people aren’t clear about what their values actually are, the decision making process gets very muddled and confused. Maybe even hypocritical. When I was a classroom teacher, my school came up with four “Core Values”: Respect, Integrity, Kindness, and Responsibility. (I just checked their website and they’ve since added a fifth, Perseverance.) The school gave out monthly awards and had us hang posters in our classrooms about these values. Nothing against respect, kindness, or any of the others, but I thought it was weird that not ONE of the school’s core values had anything to do with actually learning. That’s because the staff had many serious disagreements when it came to what kids should be learning. We didn’t have a coherent educational philosophy. And it led to huge wastes of money and time. In my many years there, I saw the same mistakes over and over again. The school would buy a super expensive curriculum, then junk it after a year or two because it didn’t meet our needs. We’d have meeting after meeting about what to change about our report cards or morning routine, only to end up sticking with the unsatisfactory system we’d had before. Morale was in the tank, and turnover of teachers was high. 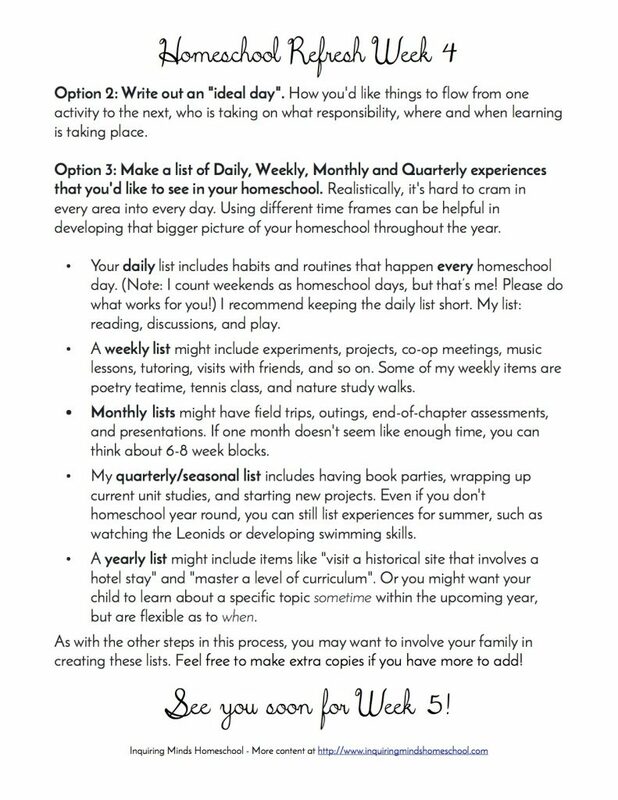 Before you spend one dollar on curriculum or make a fancy chart with goals for the school year, get clear on your homeschool vision! Let’s take a look at this week’s printables that will help you do just that! 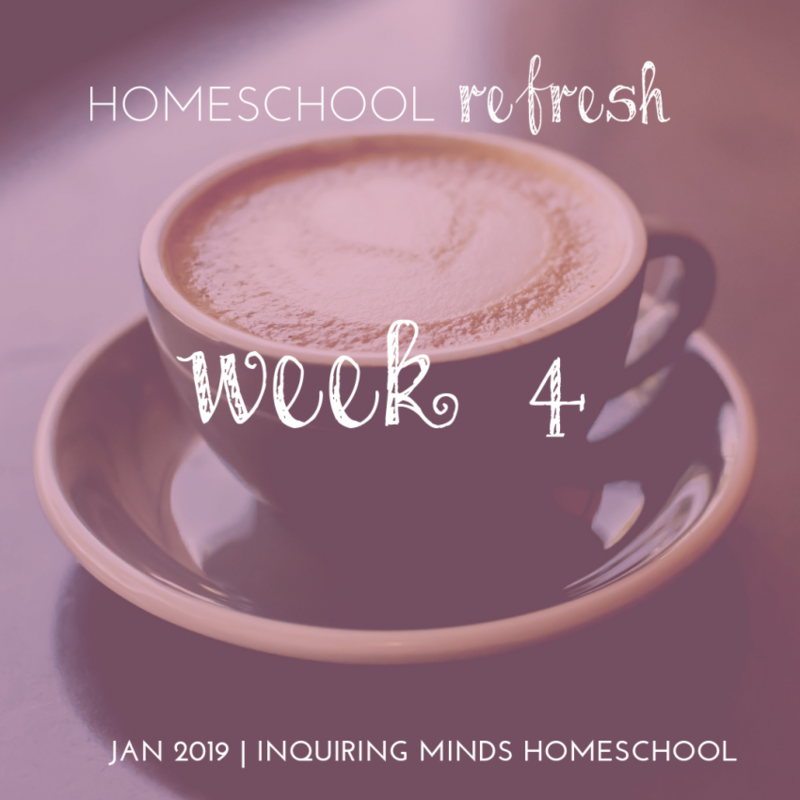 If you signed up for the Homeschool Refresh already, you got Week 4 sent straight to your email inbox. If you haven’t signed up yet, no worries! 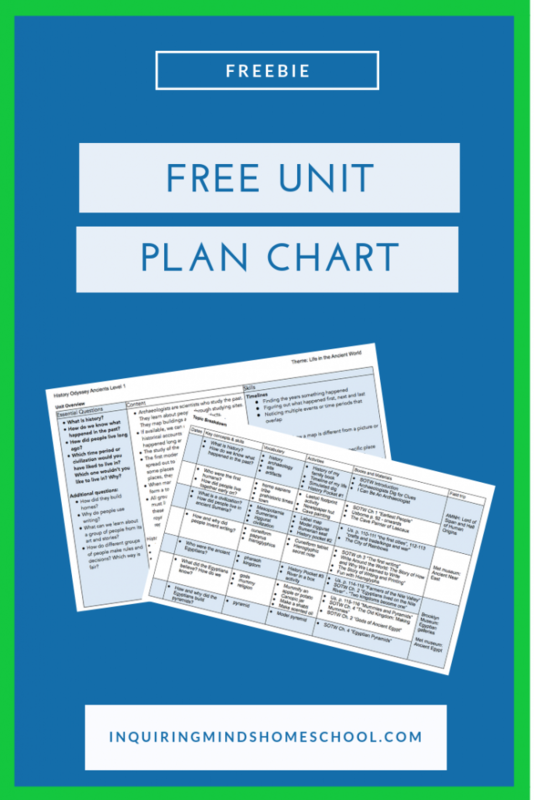 You can do that by clicking any image or link on this page, like this one: Send me my free worksheets! For this type of brainstorming, one size may not fit all. 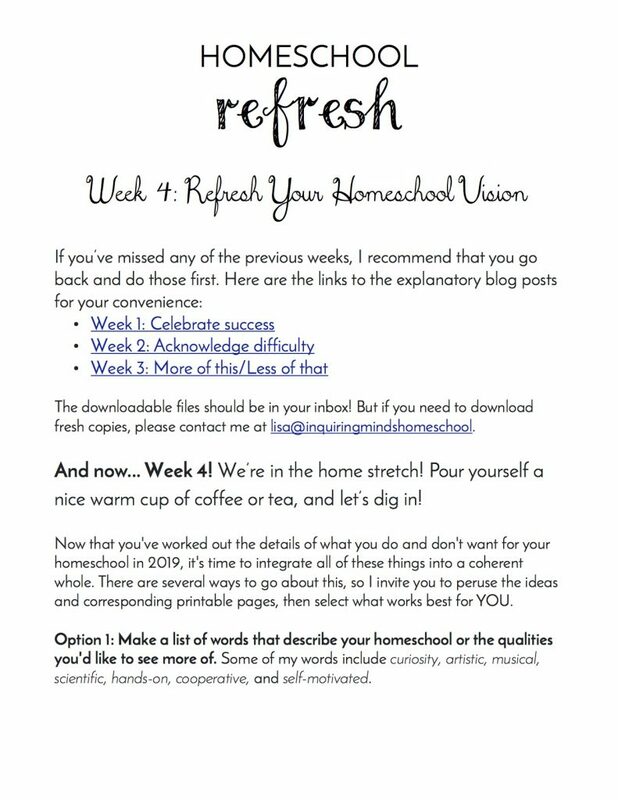 So, I provided three different formats to help you hone in on your homeschool vision, or refresh the one that you already have! Option 1: Make a list of words that describe your homeschool or the qualities you’d like to see more of. Some of my words include curiosity, artistic, musical, scientific, hands-on, cooperative, and self-motivated. 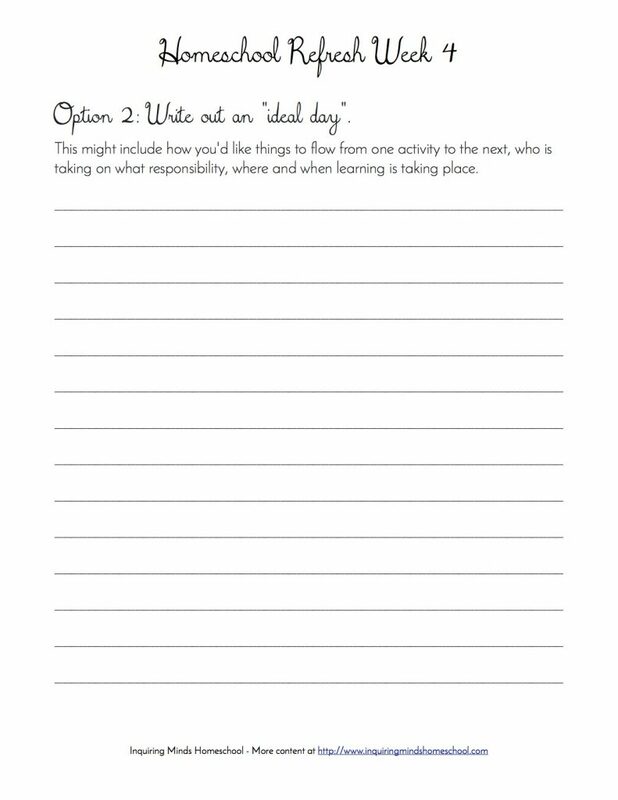 Option 2: Write out an “ideal day”. How you’d like things to flow from one activity to the next, who is taking on what responsibility, where and when learning is taking place. 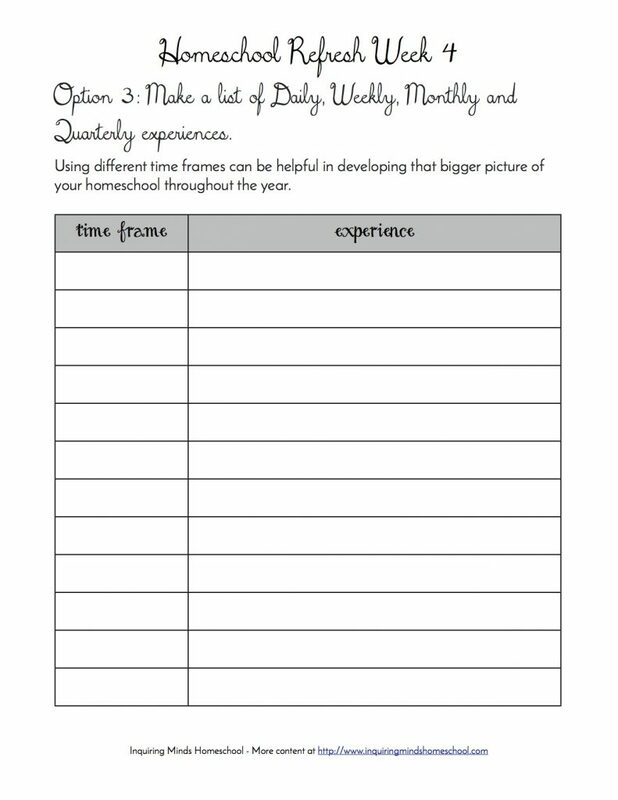 Option 3: Make a list of Daily, Weekly, Monthly and Quarterly experiences that you’d like to see in your homeschool. Realistically, it’s hard to cram in every area into every day. 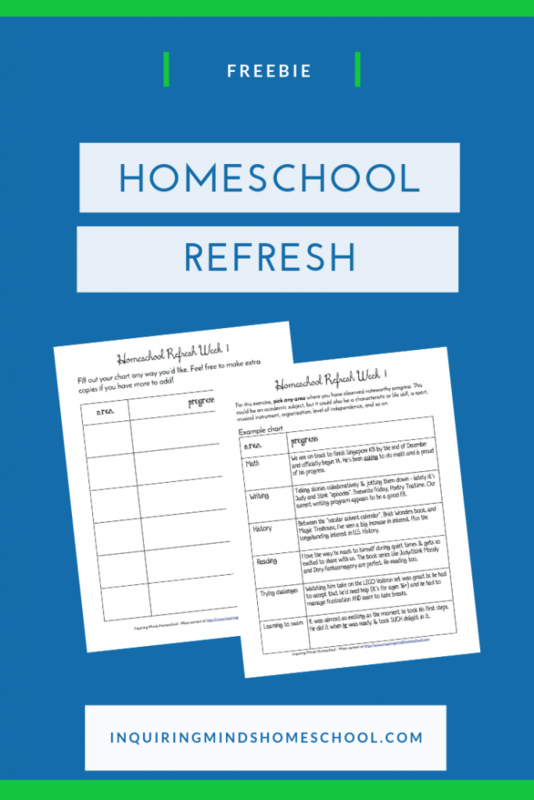 Using different time frames can be helpful in developing that bigger picture of your homeschool throughout the year. What does this look like in practice? In the next day or so, I’ll be filming some short video clips talking through each of the options. If you already follow me on Instagram (@inquiringmindshomeschool) you’ll see them in my IG stories! Don’t worry, I’ll post them here as well! We’re almost done! How are you doing? Thanks for being a part of this community! To be automatically updated when new content is posted, as well as get the free worksheets for this challenge, click the image below to join our mailing list. Homeschool socialization. Here’s the results from my ig stories poll so far. What do you think about the community & support system in your area? . I was pretty ticked off when I posted this poll. I had just come home from yet another scheduled meetup in which people were no shows and didn’t send a message to let me know. I get that things come up, emergencies happen, logistics don’t always work out. But seriously – three different times this week I have asked my child to stop his activity, get ready, get to a place, and then sit around waiting because no one else is there. Three different times this week with different groups. It is so disappointing to keep telling my son that we are meeting friends and then we are sitting there waiting. My son doesn’t complain – but maybe he should. . I absolutely don’t mind having alone time with my kid, so I guess that’s the bright side… but I’d like to have some reliable homeschooling socialization too…. . What works for you? As an Amazon Associate, I earn a small commission from qualifying purchases at no cost to you. Thanks for supporting this site!